My heart danced when my dad made a baby bed out of wood for my dolls. All I ever wanted to be when I grew up was to be a mamma. In time I would learn that God and I were not on the same page. His timing was not my timing when it came to marriage or having babies. When thirty came around, I was the single girl at weddings. At thirty-five everyone I knew had babies except me. I started to believe that my childhood dream to be a wife and mom was never going to happen. I felt like I was dying inside. With thirty-eight candles on my birthday cake and sadness in my heart, I hid behind hurt doors wondering why God would make me wait so long. Maybe it was never meant to be. But I was wrong. I met my husband that year, and was forty when we got married in 2006. We wanted to get pregnant right away but we didn’t until 2008 when we had our son. In 2009 we started trying again, and sure enough, I got pregnant. But this pregnancy left my heart breaking and it never quite mended. I don’t expect it will, either. At our second doctor’s appointment we learned that our little blessing was not growing, and were told that I would have a miscarriage. I refused to believe it. I prayed night and day for God to save my baby. We called our loved ones and friends to pray for a strong heartbeat. My husband and I went for long drives, parking at dead-ends and pleading with God to help our child grow. A week went by and our doctor told us there was no heartbeat. My world around me stopped. I disappeared into a fog for weeks. A week after the news, I started bleeding and cramping. My heart broke with every cramp my body felt. This went on for a couple of days. I was devastated and angry at God, yet I held on to Him through it all, and He brought me comfort. 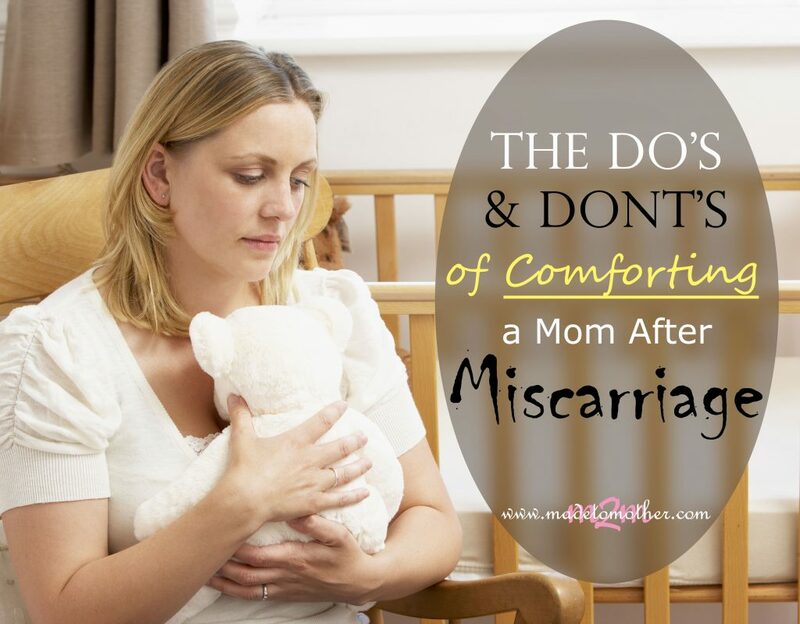 No one really knows what I felt, and I can’t assume that others who are grieving through a miscarriage are experiencing the same things I did. My friends sat with me, and my husband helped me to bed when I couldn’t get there on my own. After our miscarriage we were going to wait for several months before trying again but I got pregnant soon after and my sweet little girl was born January 2010. Evenso, I have never forgotten that lost little one. Every year on April 20th we celebrate our unborn child’s birthday with flowers and candles. This is the day that the Lord took our child home. My husband, James and I believe that we will see our little one there. I’m excited for that day and I’m disappointed that I have to wait. No not really. We live in a fallen world where things like this happen. God loves us and He has a plan for our life that is good. You don’t know that and your statement minimizes the pain they are feeling now. They already know that, but that doesn’t change how they feel about the loss of this child. The truth is, those of us who have experienced miscarriage never do nor should we. Does it really matter? Any stage is painful. Send her flowers, a card, or a gift to let her know you care. Let the hurting mom lead the conversation. Some moms like to talk about it while others want to be silent. Ask “How do you feel?” or “Would you like to talk?” or “Do you want me to be with you?” and follow her lead. It’s hard to watch someone you care about go through a painful time. Many women get depressed and angry. Some weep for days, while others break down years later unexpectedly. This is normal and healthy. Take note of the date she had her miscarriage and every year send her a little card to let her know you care. The biggest thing we all can do is show up when a Mom and Dad go through this. Family and friends sometimes avoid showing any emotions because they don’t know how to help, or they don’t see what the big deal is. But it is a big deal and we all should show our condolences. It’s the right thing to do. 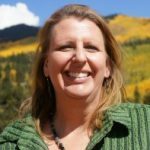 Lisa is a homeschooling mom to an eight-year-old boy and a six-year-old daughter, and thinks it is awesome. Her husband is her best friend and they live in Colorado where the colorful Rocky Mountains sit boldly under the blue ski. Lisa is also the creator of two blogs, The Family Road Map and Joy Abounds. The Family Road Map is filled with inspiration for Moms and helpful parenting tips for all. Joy Abounds is full of encouragement and Godly Wisdom for Christian Living.